Pillage Idiot: Report from Columbia U. A correspondent -- we'll call him "Number One Son" -- was in New York and got close to the events at Columbia, where one of the two remaining leaders of the Axis of Evil was speaking. Here is a lightly edited version of his report. A few photos he took will follow. So I heard that Ahmadinejad was coming and I couldn't pass up an opportunity to maybe have chance to toss a bag of doo doo at his motorcade. 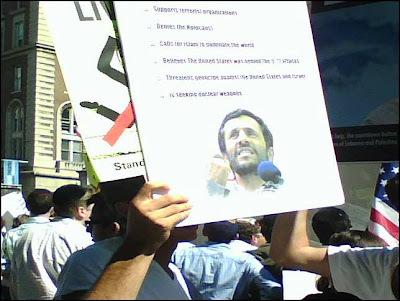 Too bad that when I got uptown and met up with XXXXXX, members of the anti-Semitic New York City Police Department were cruelly preventing everyday Hebrew citizens like myself from rushing the building and kicking Ahmadinejad in painful places as hard as we could. Anyway, I couldn't get into Columbia's campus with out a Columbia ID so XXXXXX and I stayed on the west side of Broadway first near the ZOA protest. A lot of kippahs, long skirts, and political opinions that I'm not gonna say whether or not I agree with. Of course, the crazies came out. 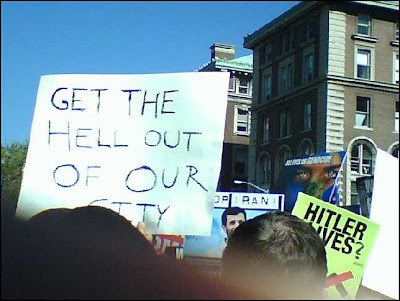 Signs like "Honk if Bush is a War Criminal". XXXXXX and I told the guy he was at the wrong protest. Also "The US is to Iraq as Israel is to Palestine as Nazi Germany is to Jews" and "Ahmadinejad Is Bad, Bush is Worse something something I'm An Incredible Moron That Enjoys Smoking Crack Cocaine On A Regular Basis. Oh Yeah And Impeach President John Kerry Or Something". Luckily these people were yelled at a lot and it was explained just how stupid they were, as if they deserved even being spoken to. It's annoying how they get attention just because they are so outlandishly stupid. If you missed the rest of their protest, you can probably get all the details at the home of the president of Iran, although I don't think these people advocated nuking Israel. (To be fair, I didn't specifically hear any of them say they did). At this point XXXXXX and I left because the civil, respectful, and well reasoned debates over US-Iran policy and whether or not Bush knocked down the WTC with special mind beams he got from Neo-Conservatives got to be a little much. There were a lot of good signs that I didn't get pictures of and in general I was happy that there was such a good showing. 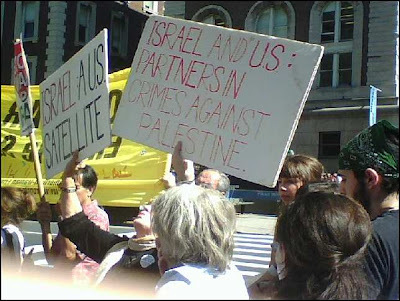 Apparently there was a much bigger protest at the UN. With these photos, I'm going to append the captions supplied by NOS. 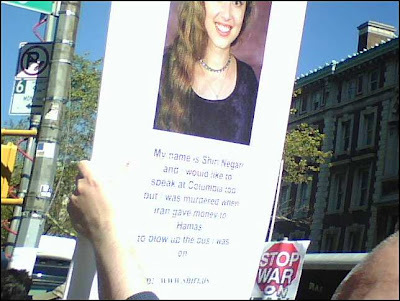 "My name is Shiri Negari and would like to speak at Columbia too but I was murdered when Iran gave money to Hamas to blow up the bus I was on." * Suffice it to say that the word NOS describes as "unprintable" is the compound D-word thrown around a lot at Ace of Spades HQ. UPDATE: Lots more from Michelle Malkin. UPDATE (9/26): And even more from the Washington Times Culture, Etc. Blog, especially about Shiri Negari.